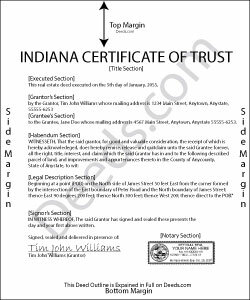 Codified at Indiana Code 30-4-4-5, a certification of trust is a document presented by a trustee as evidence of the trustee's authority to act on behalf of a trust. Lending institutions or other third parties might request a certification of trust before they enter into any transactions with a trustee. Since trust instruments are not recorded, the identities of those with a beneficial interest in the trust remain private. The certification presents only the essential information needed while maintaining confidentiality of personal information a trustee or trust maker may not wish to disclose. The certification verifies the existence of the trust under which the trustee is named. The document provides basic information, such as the name and date of the trust; the type of trust and who, if any, retains a power to revoke the trust; the identity of the trust's settlor; and the identities of all acting trustees. If a trust has co-trustees, the certification states how many co-trustees are required to sign off on documents relating to the trust, as well as their identities. In addition, the certification provides the name by which the trust is to hold assets. As with other documents relating to real property, the certification should include a legal description of the subject real estate. The document may be executed and signed by any acting trustee and acknowledged before a notary public. Certifications can be recorded in the county or counties in which the real property is situated. Finally, the powers of the trustee relevant to the transaction at hand are laid out. A recipient of a certification may request additional excerpts from the trust instrument, such as those which designate the trustee and lay out the trustee's powers to act in the pending transaction, but the recipient can reliably act on the information contained in the certification alone as if it were fact. Requesting excerpts from a trust instrument opens the requester to certain liability under Ind. Code 30-4-4-5(h). Trust law is complicated, and each situation is unique. Consult a lawyer for guidance.